Welcome STudents of the Book of Concord! This page contains the full set of audio recordings from Lutheran Confessions (THL-510) as instructed by Dr. Alfonso Espinosa at CUI in the summer of 2016. Presented in the center column below they proceed from day 1 of class to the final day 15 - mostly in two or three parts for each day, depending on the breaks in recording. TO DOWNLOAD: Right-click where it says "Download File" and navigate to where you'd like to save the .mp3 file. Alternatively, you can just normally click "Download File" and listen via your web browser. PLEASE NOTE: Available to July 4, 2016 only! If you decide to click "LISTEN" in the right hand column, you can hear the designated creed's or confession's preface or intro, brought to you compliments of Librivox Recordings. Thank you Librivox! The same folks that bring you the B of C on audio also make available the whole text of the Book of Concord online. The Apostles', Nicene & Athanasian Creeds in audio format are available in their entirety HERE for free. Click below to hear the preface to the AC. Both the AC & its Apology in their entirety are available to listen to HERE. Do You Have Your MOBILE BoC? 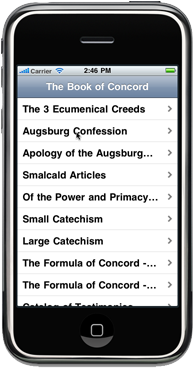 Click HERE or on the image above to download the entire Book of Concord app for your smartphone. Below is linked the preface to Luther's Large Catechism, but you can hear the entire Catechism, Large & Small HERE. Click below for the preface to The Smalcald Articles. Click HERE for entire audio, as well as the Treatise on the Pope. The link below is for the Solid Declaration's preface. Click HERE to listen to the rest, as well as the Epitome.